See my name on the cover?!? BOOM!!! For the past few weeks, in and around moving from one house to another, I've been working on getting a hardcopy version of "The Endless Winter" up for sale somewhere. Actually, let me clarify that... This all started with my own desire to have a tangible, hardcopy version of something I created that I can hold in my hands, raise over my head and shout "I MADE THIS!!!" I've been doing game design for nearly twenty years and everything that I've published has been virtual; when asked "can I see the game you wrote? ", the only response I had was "go to this website and download it." Now I actually have a physical product I can shove in people's faces screaming "HERE!!! LOOK!!! THAT'S ME!!!" while I'm giggling like a schoolgirl. This all may sound somewhat silly to you... But I have to admit I'm somewhat old school in this regard. In this day and age, where the print medias are dying a slow and painful death at the hands of e-readers, a physical copy is meaningless and might never be bought by a single person. In fact, I myself might be criticized as a "tree killer" for even considering printing a product. But, you know, it feels good to hold it in your hands. It really does. It's like cradling a newborn child, thinking how you made that possible with your own two hands (or other parts, as the case may be). It's extremely satisfying. So in order to figure all this out I used two separate venues: Drive Thru RPG's printing service and Lulu. As I analyzed these two services, I noticed that Lulu was significantly more expensive then Drive Thru RPG, and I wasn't sure why at the time. I mean... it's an identical product, isn't it? Well here's a little more information on that. "The Endless Winter" was already listed on Drive Thru RPG, so it seemed a logical choice to try their printing services. It also helped me understand exactly what is involved in getting something ready for publication - I have to start thinking about things like bleed, saturation and color space, proper contrasting colors when printing to black and white, etc... - so there was a lot of trial and error as I went back and forth. It doesn't help that it takes Drive Thru RPG three days to tell you the file you uploaded was wrong, so it took me almost two weeks to get a version finally viable for publication. Drive Thru RPG forces you to order a "proof" of the publication before you can put it up for sale, and you have to buy it at the price it costs to print (more on that later) and with royalty credit, so I ordered both softcover color and softcover B/W. When I got them, I was excited beyond belief - "look mom! I wrote this!!!" - but there were still some issues that had to be addressed. And those issues were mostly due to color selection and contrast, such as the "Dark" in the word "Darklight" being illegible on the cover (due to a lack of a lighter edge) or the wooden bridge being indistinguishable from the chasm in the black and white version due to no contrast. Nothing major, and all easily corrected. Drive Thru RPG was pretty reasonably priced, significantly cheaper than Lulu, but you do not get a free proof. As far as royalties, if you sell a copy your revenue is calculated after they take their printing cost; for example, if you sell your book for $20 and it costs $15 to print, your revenue is based on the $5 difference. For every publication you get a free ISBN (owned by Lulu, but still). This is a somewhat important number, and identifies your product as unique to the world. If you were publishing on your own, it would cost you $125 to get one ISBN (the price goes down if you buy several at a time). Lulu has several other avenues of sale than just their website; you can sell it on Amazon, for example. Your profit may get eaten up by the $10 "Retailer Fee", so you might want to start hoping for some serious volume. The first proof of a product is FREE. You have to pay for shipping, but that's significantly cheaper for something that could effectively be a shot in the dark. And, above all that, I have to say one thing: the hardcopy proof I received from Lulu is stunning compared to the Drive Thru RPG one. Print quality and materials are superior by far, it's not as over-the-top glossy as the Drive Thru RPG prints (which are pictured above) and it just feels like a quality product. By comparison, it makes the Drive Thru RPG softcover feel like newspaper stock. Lulu's very blunt about their prices, but they do not appear to take a percentage beyond the cost of printing the product. So if your product costs $15 to print and you sell it for $20, you keep the $5 difference in full. Despite that, since Lulu's prices are higher you're not making as much money, but with the possibility of selling it across multiple major venues that may balance out due to volume (one can only hope). 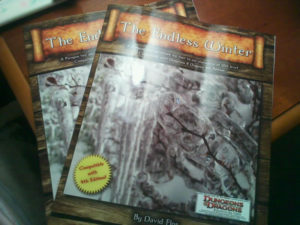 So while I wait for my final proofs from Drive Thru RPG, I have listed "The Endless Winter" on Lulu. I'll be honest: that's not the price I want to sell it at, but as it is I'm not making a whole lot of profit and if I price it any lower I'm losing money. Once the Drive Thru RPG proofs clear, I'll list it there significantly cheaper but arguably inferior in quality. Is the quality worth the significant price difference? Some would argue yes, others not. Personally, if I saw both products side by side I'd be somewhat hard pressed to pay almost double for the Lulu one, but I guess it matters on what you're buying. If this was meant to be a coffee table book or something that would serve in part as decoration then yes, the Lulu book is much prettier. If it's just to run the campaign, heck, I can do with printing the PDF personally. Want to save a few bucks. Just want a print copy, knowing full well that it's not as high quality of a print copy as it can be. Are feeling charitable and want to help me out by buying at a place that gives me better revenue margin. Have store credit that you want to burn. Want a high quality, really nice looking product. Want to help put me at the top of Amazon's bestseller list. On a semi-related note, I am in the process of creating my own online store where I can sell all my products and not have to worry about someone taking part of my margin. This will allow me to do things like buy hardcopies in bulk (Drive Thru RPG gives a 5+% discount if you buy 50 or more of your own product) and make more. Stay tuned for that! I have a few other things in the works, including another module that is somewhat inspired by Fourthcore. Once I have something to show for that, I'll post it. One teaser: an exploding island is involved... Should be fun. I also have some more Gamma World Remnants to post, such as the reactor room from Where Worlds Collide. That will be posted in the next week or two. In the meantime, you can watch the orc horde trounce anyone that opposes us in the Fourthcore Team Deathmatch, Round One!!! I cannot agree more, the feeling of holding a printed copy of your work is incomparable. Even now, with 6 printed books (technically 12) under my belt, the feeling is still the same for each and every one. I looked at Lulu at first and the price scared me off. My printed adventures are designed to be cut up (the maps) so having a higher quality printing is not needed. But I might look at putting the campaign books on Lulu for a higher end product (like a “deluxe” version) in addition to the DriveThruRPG versions. Now, when my novel is ready for publication, Lulu might be the better answer for exposure. Thanks for posting this, I know it will help other publishers who are wanting to make this jump! Really useful and timely information, thank you!